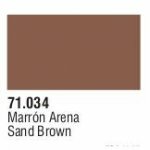 Game Color (72037) Filthy Brown 17 ml. Model AIR (71012) Dark Green 17 ml. Model AIR (71027) Light Brown 17 ml. Model AIR (71034) Sandy Brown 17 ml.